On this day in 1931 former NY Titans LB Eddie Bell (not the WR from the 70's) was born in Philadelphia. Eddie passed away in 2009 at the age of 78. Also, on this day in 2014 Former Buffalo Bills owner Ralph C Wilson passed away. 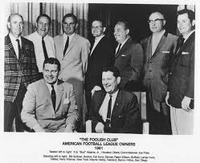 Mr. Wilson was a Charter owner of the Bills in 1959 and was the legal owner until last year. Mr. Wilsons loan to the failing Raiders may have saved the AFL in its early days. Correction to last year's thread. We did not actually sign him on this date, he was signed to an offer sheet 5 days earlier, on March 20. This was the date that the Patriots refused to match the offer, and Martin became a Jet on 3/25/98.